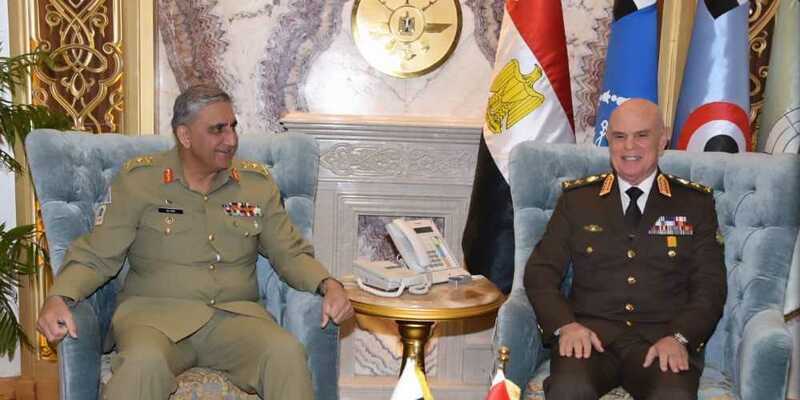 In an official visit to Egypt, Chief of Army Staff (COAS) General Qamar Javed Bajwa called on General Mohamed Zaki, Commander in Chief of Egyptian Armed Forces and Minister of Defence & Military Production and Lieutenant General Mohamed Farid Hegazy, Chief of Staff of the Egyptian Armed Forces. According to the Inter-Services Public Relations, the two sides discussed matters of mutual interest, military to military relations, defence and security cooperation. The Egyptian leadership praised the professionalism of the Pakistan Army and the determination of the Pakistani nation in combating terrorism. Both the sides agreed to increase bilateral cooperation in multiple fields including joint ventures, defence production, training and intelligence. They also agreed to improve cooperation for regional peace and stability, the ISPR statement said. The army chief also met Sheikh Ahmed Al-Tayeb, Grand Sheikh of Al-Azhar, who commended the efforts of the Pakistan Army in eliminating the scourge of terrorism from the country.